Isabeau courageously exchanges her father’s life for her own and agrees to remain with a Beast for a year in this retelling of Beauty and the Beast. Sign me up to receive news about Leife Shallcross. This book had high expectation but, sadly it missed the mark for me. It was hard to get connected to the characters and keep track of the story. Maybe because I am a huge Beauty and the Beast fan it was hard for me to like and stick with it through the end. Sadly it fell flat for me. I found this to be a beautiful retelling. By doing the Beast's pov it gives the story a different edge and doesn't make it seem redundant to all that has came before. Though I did find this similar to the 2014 movie (which I also highly recommend). I do warn that the book is very wordy, some parts dragged for me and I was hoping for more of a development from Isabeau. The magic of the castle was my favorite part. Telling the story from the Beast's point of view didn't work for me. As he's trying to excuse threats and imprisonment, his loneliness doesn't quite cut it. After he decides to be a slightly better person, he's still very focused on his needs, and his selfishness drives much of the story. The twist on the story--the way the gardens work, why he was cursed, and such--is interesting, and the writing is engaging enough. It's a good read for fairy tale fans, as long as you're okay with some whining. The first thing that comes to mind with this book is that it is pretty darn wordy. It clocks in around 416 pages and while it isn't filled with information dumping, it is filled with description. This is sometimes annoying, but it actually fits the fairy tale style of "The Beast's Heart" pretty good. That's not to say it could have been a tad shorter in my opinion, but on the whole, I still enjoyed it. "The Beast's Heart" is a retelling of one of my two favorite fairy tales, Beauty and the Beast. And I LOVE LOVE LOVE the Beast. I do find Belle somewhat annoying and some of that carried over to Isabeau, and there is one aspect of the Beast that drives me absolutely MAD in this version, but I still LOVE him. In this novel, we get the story from Beast's POV and it was absolutely wonderful to see what he experienced and learn about the curse and his following struggles through his own words. I also really enjoyed the side characters, Isabeau's family, who we see through a magical mirror that allows Beast to check in on them. Marie and Claude are quite interesting and have stories of their own. I don't feel I really need to give you much on the plot because we all know how it ends right? Or at least I am assuming most people do or why are you considering this book? But I still feel if this is a tale you love, then you need to give Shallcross' version a chance. Just be prepared for a lengthy read but enjoy getting lost in the prose. Beauty and the Beast is my favorite fairytale, and I'm always looking for a retelling that really does it for me, unfortunately I still haven't found it. That definitely brought this book down for me along with the fact that it feels so long, but I hope other people who read it will enjoy it. I love fairytales, and I love various adaptations of fairytales, so I was very excited to read this, especially since Beauty and the Beast is my favorite Disney story. I was especially curious to see the story from the Beast's point of view. I did not finish this book. The plot advanced much too slowly, and it was hard to maintain the same level of interest as the chapters dragged on. I loved how descriptive the author was of the scenes, but it got repetitive. I'm a bit conflicted with the character of the Beast; he feels very childish and insecure, and though it was obvious he was trying to be a better person, I wasn't able to connect with the character beyond feeling pity and a bit of annoyance. My favorite part of the book is Isabeau's sisters' stories. This would have been a much stronger book if it focused on how Isabeau's family dealt with the aftermath of her leaving the family; I would've devoured that book. I don't know if the book improved in the second half, as I only made it through Chapter 24. I will definitely give it a try again later on, especially to finish her sisters' stories. But their stories are not enough, and I would not recommend this book based on what I've read of it. Oh goodness. Another man who won't take no for an answer and feels he knows a woman's feelings better than she goes. Do not recommend. I thought this was cute spin on Beauty and the Beast. The well-loved story from the Beast's point of view. It was heartbreaking! I liked that Shallcross brought back the French-ness from the original story that wasn't seen much in the Disney animated movie or the newer live action movie. This story was a lot closer to the original. It was really good and I didn't want it to end! The magic of it was beautiful! I look forward to more Shallcross books, hopefully more fairy tale retellings! I love fairytales, that was my first reason to read this book. It is the retelling of the story of the Beauty and the Beast entirely from the Beast's perspective. It comes out somewhat depressing at some points, which is understandable since he is cursed and dealing with everything. And, although he does seem like someone trying to connect, his undevoted affection for her seems a little too corny. Nonetheless, as this is a fairy tale, I must say it was quite compelling, mostly in the writing and the feelings of hope and shame Belle's (Isabeau here) sisters go through as they start their lives without her. It's a different perspective. Not better or worse than the original. This book was different than my normal read, but I really enjoyed it. It was a slightly different take on the story than the Disney version, but that was good because it would have been boring otherwise! Some points were a little long winded, but overall written very well. The Beast’s Heart is a retelling of Beauty and the Beast, narrated entirely from the Beast’s perspective. The Beauty in this book is named Isabeau, and the story focuses a lot on her sisters, Claude and Marie. Isabeau also doesn’t have any prior suitors or an angry village mob to worry about; it’s purely about her family, the Beast, and her. The writing style is long, flowery, and elaborate; reminding me a bit of Jane Austen’s novels. And this book -feels- long. Despite seeing the story from the Beast’s perspective, at points it felt like he was just the narrator of Isabeau’s sisters’ lives, whom he spends seemingly most of his days spying on through his magic mirror (he’s hooked just like us watching Instagram stories in 2018). The Beauty and the Beast was one of my favorite fairy tales growing up because I melted at the idea that a love so pure could magically fix a monstrous person… Until I grew up and learned how harmful that idea is in the real world, because it disregards the fact that a person needs to -want to- fix themselves for anything to change, regardless of the amount of people that are trying to help. Outside of fairytales, a girlfriend can’t fix an abusive boyfriend out of love alone. But the HUGE plus in this book is the Beast wants Isabeau to grow to love him, even before he knows she is indispensable to break the curse. And there’s no ulterior motive; he KNOWS that the only way to achieve both of those goals is to genuinely become a better person. He does commit a series of glaring mistakes (that I’m sure feminist readers could easily spot, and also anyone who hated Twilight), but he is self-conscious and regretful about them and actively thinks of ways to improve not just his behavior, but his overall essence. I thoroughly enjoyed this book, even though it occasionally felt too long, and the action between Isabeau and the Beast was very repetitive at times. I would recommend this to: readers who love fairytale retellings, someone who wants to read a book that contains romance but isn’t in the romance section, and people who have always felt compassionate for the Beast and wanted to hear his side sometime. I really enjoyed this story. It was moving, magical, and it really captured my attention. I found myself constantly trying to get one more page or one more chapter in. We get a lot of glimpses into what Isabeau's family is up to while she is with the Beast, and I really enjoyed that. The magical aspects to this story were interesting as well. I'll definitely be reading more of this author's work in the future. Leife Shallcross’s debut novel The Beast’s Heart is beautifully written and indulges our fairy tale dreams by bringing us into the tale of the beauty and the Beast. Understanding the Beast’s turmoil and struggles from his own perspective made me love her book and the well-known tale that much more. I fell in love with her characters and recommend this book. "Let all who look upon you see the nature of the heart beating your breast." In both reading and writing the review for "The Beast's Heart". I can not, in as much as I have valiantly tried, reconcile this book to the status of a mere retelling. The reason for that being this. This book has such lushness in its lore, emotionality, and exploration of themes such as self acceptance, love, and the human condition. As seen and experienced by way of Beast. That one quickly comes to see it as a far cry in every aspect from the tale that has been bandied about for centuries. And that the automatic comparison that one cannot help making when reading this version. Is a true disservice to both the story and its authoress. When reading Beast's tale. His despair, longing, hope, and eventual love, become palpable. They sit in the room with you as you witness his epiphanies, triumphs and failings. And as you see him discover not only what it means to be human. But what it also means to be a man in the Renaissance sense. Meaning one who knows the value of honor, respect, chivalry, education, honesty, and an understanding of motive. Both yours, and those of others. For her part. Isabeau exemplifies, patience, strength, empathy, courage, and unconditional love. And seeing her through Beast's eyes... That is truly a magnificent sight. For it's only then that one can fully come to understand what it means to "see one's soul through the eyes of another. As he does by way of Isabeau. Another feather in the cap of this read is the addition of Isabeau's siblings and their stories into things. Through them, readers are given a much broader understanding of both Isabeau and her life before. Readers are also allowed to see growth, and change as is experienced as humans by humans as their parts of the story play out. Essentially experiencing a story within a story. This is a darker side of "happily..." As it does deal with the darker sides of human nature. It is also a book that makes no attempt to pander to a younger audience. There is no "dumbing down" of the more philosophical wanderings of Beast's inner man. The Beast's Heart is a tale which harkens to a time when ogres really did eat those who trespassed on their lands. Fairies really could turn princes into frogs. And all one had to do to bridge the gap between the factual and the fanciful, was to simply turn a page. I'm a sucker for love stories told from the POV of the male character and I jumped at the chance to read the classic tale of Beauty and the Beast as told from his side. Shallcross definitely delivers when it comes to giving the other point of view, particularly because every other character that never gets explored in the original gets a motive and actual character development here. Shallcross added some original characters to really round out the story and add more depth to the plot, such as Isabeau being the youngest of three sisters. It definitely works because I was way more interested in the sisters than in our female lead. She, in fact, is a bit boring and one dimensional - which I totally forgive because that's the way the Beast character is in every other telling of this tale. It balanced things out. I have 2 complaints. One complaint is that the writing has a problem with sometimes being a bit too overwrought and over descriptive, like a teenager trying desperately sound smart and get the required word-count in a school easy. Not necessarily a bad thing, but it gets repetitive and gets in the way of the story. Complaint number two is that it doesn't always show the best ways to go about dealing with relationships, not just romantic, but in general. There is a lot of manipulation, particularly a stunt the father pulls towards the end. It left me feeling like some readers might walk away thinking that such manipulative behaviour is acceptable when it gets you exactly what you want. Not exactly the best moral for a story. Overall, it's an original version of a tale as old as time (^_^) that explores new angles and gives new, original life to something that's been told a million different times. I loved discovering how Beast spent all the time before the original story began and exploring his past and emotions as he's dealing with finding his humanity and learning to once again spend time with another. 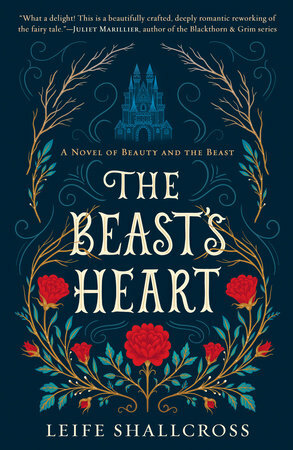 The Beast’s Heart is the latest retelling of the Beauty and the Beast story. Unlike the other retellings I have read, this one is told from the Beast’s perspective instead of Belle’s. The story opens with the backstory of the Beast’s life as a man and his early years as the Beast. These years tormented him. He considered himself lucky the day Isabeau’s father stumbled upon his castle. As in every version of the story, the Beast asks for the father to send his daughter after a rose is picked and like in the others, Isabeau chooses to come. Each day, we see the struggles in the castle through the Beast’s eyes. The two struggle as first, before settling into a routine. Eventually, the magic mirror reveals itself and allows the Beast to watch in on Isabeau’s sisters and father back in their cottage. This allows the readers to see how Isabeau’’s absence affected her family and how they changes over the year the novel covered. This included how her sisters Marie and Claude rose to the challenges that faced them and bettered themselves. However, their delicate balance is tipped when Belle sees a painting of a man in the attic and begins to have vivid dreams that often leave her sleepless and troubled during the day. How will this change things at the castle? Though it began slowly, The Beast’s Heart turned into a spellbinding novel. Though told from the Beast’s perspective, it was just as much Isabeau, Marie, and Claude's story as well. That said, by using the Beast’s viewpoint, readers will have a chance to see the Beast’s internal changes which the other versions of the story lack and this helps to humanize him. And using the mirror to look in on Isabeau’s sisters help the Beast to see things he could change and assist with as they unknowingly taught him lessons. All of this draws the reader into the Beast’s plight and forwards the plot. In addition, he focus for each of these four main characters was how one’s struggles could make them better, so a life lesson had been taught as well. If a reader is interested in fairy tale adaptation, this novel would be a welcome addition because of this unique perspective. I found this book to be immensely refreshing, yet extremely repetitive as the Beast shares what his emotions are. I liked that Beauty is one of three sisters and that the father is more of a character in this retelling. I think the description was good and I found this book to be really creatively written and descriptive. Thanks for the ARC, First to Read. I always look forward to retellings for the usual reasons. So it’s pretty obvious why I wanted to give The Beast’s Heart by Leife Shallcross a try. It’s a Beauty and the Beast retelling told from the perspective of the Beast, and I was looking forward to what twists Shallcross would inject into a tale that’s already so familiar. I liked this book. It was long and it followed the general plot of Beauty and the Beast—so, if you know anything about the story, some parts of this one will feel familiar. Yet, The Beast’s Heart was still an interesting retelling. From the first page, I was drawn in by Shallcross’s writing. It was descriptive and expertly conveyed what the Beast was going through as well as the setting and the magic present in the story. Shallcross did a good job at creating a better picture of the loneliness he went through during the time he spent isolated in a forest and then in his chateau. So, one thing I did see more of was what the Beast was doing before the usual starting point of the story, and when he had time alone thereafter. I also liked how Shallcross handled the other parts of the story. With so limited a focus, I was afraid that some of the other characters—like Isabeau’s family—would get lost while the story played out between her and the Beast. But, that wasn’t the case at all. There was a gradual progression of the story for both main and secondary characters. And I have to say that I enjoyed how those parts were ultimately incorporated into the rest of the story. Now, one thing I do have to talk about is how familiar parts of the story felt. Because this was a retelling that closely followed the original tale, it took away some of the surprise that might have come with certain revelations had there been more differences. It wasn’t that big of an issue. Other than that, the story was good. Overall, The Beast’s Heart was a solid retelling of Beauty and the Beast. And, if you’re a fan of the original tale, then maybe consider giving this one a try. Needless to say, I’m looking forward to whatever Shallcross writes next. When I asked a group of my high school students their interpretation of the message in Beauty and the Beast, they emphatically answered that it's not what's on the inside that counts. However, I then proceeded to point out to them that the "inside" of the beast, at least in Disney-fied and many other version of this tale, is that of a jerk for much of the story. For the most part, he's not nice and does not deserve Belle's affections or kindness. Finally, we have a retelling that breaks this mold. Keep in mind, Leife Shallcross' The Beast's Heart truly is a retelling of the traditional tale. There is not much different plot-wise: a prince-turned-beast, a father in need stumbling upon a castle, the beast saves his life, the beast demands the father's youngest daughter in exchange for his life, youngest daughter shows up, the two tiptoe around one another for months, and then the beast and daughter fall in love. Readers will finally see the tale from Beast's point-of-view, and it is rather refreshing, honestly. Beast hates himself more than anything, and acknowledges his selfishness while also having brilliant moments of selflessness. Leife Shallcross' The Beast's Heart is a gorgeously written retelling of a classic story, shedding light on the other side of the tale to allowing readers a glimpse into what it's like for a man to find himself inside the body of a beast. This story was beautiful. I haven't read something so lovely in quite a while and it refreshed me immensely. I could feel the Beast's pain and this re-telling of the original fairytale from his point of view is a tale I'll always treasure. I'll be sure to tell everyone I know who loves fairytales and re-tellings about this book. Thanks for the advanced reader! I loved this retelling of Beauty and the Beast. The author did a wonderful job with the emotions of Beast - how lonely he was, the despair of his situation and the anger he had in his past life which led to his becoming a beast. I also enjoyed how cautious Beast and Isabeau were with each other and how love slowly grew between them. The additional character stories of Isabeau's family added to the story. My interest was kept throughout and I even got teary eyed at times from sadness and from happiness! My only let down was not finding out who the Fairy was and her connection to Julien's grandmother. I will look forward to reading more from this author. Thanks to Penguin for the early copy to read. I’m sorry. I really wanted to like this book but I finally had to abandon it and go on to something else. I just could not get into it and after 100 pages I said enough. I like a good fairy tale but this was just not for me. Thanks for the opportunity but I’m glad I didn’t spend money on this one. “Enchantments and dreams: I suspect they are made of the same stuff. They each beguile the mind and confuse the senses with wonder and strangeness so all that was familiar becomes freakish, and the most bizarre of things intimate and natural. For the longest time after the curse fell, I did not know if I was a beast who dreamed of being a man, or a man who dreamed he was a beast.” I received a free e-copy through First to Read from the publishers at Penguin Random House. Trigger warning: suicide. It’s been over a century since the Beast was cursed into a monstrous form, a century of roaming the woods like a wild thing and returning to his decaying castle to re-teach himself how to be a man. His invisible servants see to his needs but do nothing against loneliness. When a weary traveler finds his way to the castle, the Beast has visions of the man’s beautiful youngest daughter. Desperate to meet her, the Beast tricks him into bringing her there, and Isabeau agrees to stay for a year. For the first time, the magic of the castle is affected by someone other than the Beast himself, and he begins to wonder if she might be the key to breaking the curse. This is lovely, languid retelling of the Beauty and the Beast story from the Beast’s perspective that closely follows the plot of the original fairytale. It’s full of whimsical magic and lush descriptions that might be over-done for some readers, but I found myself fully enjoying Shallcross’s world. I could almost see the castle in all its glory and decay, feel the course fur of the Beast’s paw, smell the roses in the magical garden. The plot is slow-moving, and the biggest conflict is obvious from countless other retellings: the Beast must convince Isabeau to marry him to break the spell. That’s all. There’s no twist, little outside danger, and few surprises, but I was wholly immersed in the story, regardless. It’s very much a novel of character. We share all the Beast’s inner thoughts and reactions, plus observe most of Isabeau’s and her family’s through the enchantment of the castle and the magic mirror. Far from being beastlike, the Beast is gentle, kind, and generous. He frets constantly over Isabeau’s happiness and despairs of the impending loneliness when their year is up. Isabeau’s character takes more time to emerge. She’s kind, patient, and stubborn. Unlike the Belle of the Disney version, she doesn’t love reading or, it seems, any particular pastime more than the others. Her struggle against her feelings for the Beast is fascinating, and the reader is able to guess that she dreams of him in his human form long before he realizes it. I was well-pleased with her ability to stand up for herself and the life she wants toward the end of the novel; in true heroine form, she shows a lot of gumption. I like that Shallcross takes pains to remove the abuse from the story. The Beast regrets manipulating Isabeau into the castle and almost immediately releases her from her promise. She stays because she agrees to, not because she’s a prisoner, and there’s nowhere in the castle or its grounds that she isn’t allowed to go. I read a few reviews accusing the Beast of emotional abuse, but I felt the opposite. He has a strong tendency to hover over her and worry about her well-being, but he gives her space when she asks except in the instance where her health is at stake. (If that constitutes abuse, I have news for you about the Disney version.) There’s also the issue that the magic mirror is an invasion of privacy, and there isn’t much of a defense for that other than to say that the Beast is a flawed hero. Most of his transgressions are committed out of loneliness, and while it’s not an excuse, I could at least understand where he was coming from. Since the Beast and Isabeau don’t have much to entertain them in the castle, and one can only watch them playing music and reading to each other (cute) for so long, the magic mirror also shows Isabeau’s father and two sisters adjusting to life without luxury. I was strongly reminded of A Court of Thorns and Roses here, but unlike Nesta and Elain, Marie and Claude rise to the occasion. I enjoyed watching them grow comfortable with their new skills and seeing their own potential romances play out. I love fairytale retellings but rarely love straightforward romances, so The Beast’s Heart was an altogether pleasant surprise for me. I’d read it again, and I’ll be looking for a copy for my personal library. I review regularly at brightbeautifulthings.tumblr.com. This book tells the story of The Beauty and the Beast from the Beast's perspective. The author tries to make the Beast sympathetic, but ultimately fails. The Beast knows that the things he does are wrong, yet he continues to do them. This failure isn't necessarily a failure of the author, but of the overall story itself since it's a retelling. The author does give fairly well written descriptions of magic, the castle grounds, and the overall atmosphere of the story setting. The positives in the writing fail to fully make up for the negatives with the overall story, which again are no real fault of the author. Where the author does fail in the story is that, in it being a retelling, he had the opportunity to adjust the story somewhat to make it fresh and new. Instead it's the same story with abusive plotlines, manipulation, kidnapping, and stalker-like behavior. This story is framed as a romance, but it isn't what romance is or should be. Ultimately, if you are a fan of the original story, you will be a fan of this and if you are not a fan of the original story this retelling probably isn't for you. I have always loved fairy tales and The Beast's Heart is AMAZING! Once I started reading I could not put it down! I have never even considered this story from Beast's perspective but now that I have all renditions of this classic, for me, will never be the same! I, unfortunately, was unable to finish this book. try as I might I just couldn't get past the slow pace and wording. I had to reread several spots just to try and understand what was going on. It's a tale as old as time, but this time, from the Beast's perspective. We learn more about his life pre-Beauty, how he fought to come back from the animalistic blackness he found himself in when he was cursed. We learn a lot about Beast. A lot about his beauty Isabeau's sisters. But not a lot about Isabeau herself. She is pretty, moderately talented at the womanly arts of music and drawing, and servile. And that's about it. What every man dreams of. She has nightmares and the resulting insomnia plunges her into despair... which only Beast can cure, of course. I get that it is from his POV, and we are all the heroes of our own stories and focus on what we want to see. But after so many retellings of this tale where the beauty is such a real person, it felt like a let down. I was most disappointed in the reasoning for Beast's curse. What was meant to be a plucky twist, I suppose, seemed super forced. If Beast were alive today, he'd be the "oh, no we can't talk to women because #metoo" yuppie that we're supposed to believe has a heart of gold despite his penchant for stalking the girl he like's family because he has nothing better to do when she's not around except pout because she needs alone time. I'm ok with the Beast being a victim in his own story, I'm not into being told to believe he actually is one, especially when we get so little about the "evil" fairy -- who was in love with his grandmother?? Now there's a book I want to read. I loved this book. Somehow, out of the many fairytale retellings I've read, I can't recall ever before reading a Beauty and the Beast retelling told completely from the Beast's point of view. The Beast's Heart is a beautifully written take on a familiar fairytale that still manages to feel unique. Once I started reading I didn't want to put this book down. Beast and Isabeau's slow progression from cautious co-inhabitants, to friends, to something more was lovely to read. All in all, everything about this story was really well done. My one tiny complaint is that I would've really liked to learn more about the Fairy and her connection to Beast's family, which was only hinted at in this book. If you enjoy fairytale retellings, I can't recommend this one highly enough. I thought overall the story was interesting, but it didn't impress me. I think the writing itself could have been cleaned up a little to make the story a little clearer. I was also disappointed with the way the servants and fairy were portrayed. Although I found it interesting that the reason for the curse was different, the fairy felt convenient and although they played a big role only had two tiny parts in the story. I would rank this story middle of the road, it really wasn't bad but it also didn't have me staying up all night reading. I enjoyed this book overall, but I didn't find it to be particularly standout. I felt it could have been shortened by 100 pages and not suffered. I appreciated seeing the familiar story from a different perspective, but I also felt Shallcross watered down the Beast a bit. The Fairy's reason for cursing him never felt fully justified and I remain confused about what the Fairy's connection to his grandmother was in the first place. The characters all felt a bit flat to me and could have all used some more development. I really didn't like that Isabeau seemed the least intelligent or resourceful of the sisters. My lifelong idolization of the "Beauty" in this story didn't hold up here. I love "Beauty" because of her independence and strength; that felt missing from Isabeau. As I've aged, the whole fairy tale has felt increasing creepy to me, though I still adore it and would cite it as a favorite. This version, however, really made some of those psychological issues I have with the story stand out. Again, I did enjoy the book. I really did. But it had some flaws that I simply couldn't overlook. Wow. It never fails to surprise me when a story I know so we'll is retold and somehow becomes an entirely new tale. This retelling of Beauty and the Beast is written from the Beast's point of view and it is breathtaking. Absolutely delightful. I came to pity him, then adore him. My heart broke with his, rejoiced with his, hoped with his. By the last few chapters I was on pins and needles, as if I had no idea how the story ended...and, in fact, I didn't. It was better, so much better somehow, than any retelling of this story I've read before now. This is a stunning debut and I hope we'll see many more novels from Shallcross. Now excuse me while I have a good long cry. i requested this without knowing a single thing about it, based on the cover and title. SOLD. except, i should have read about it, YA and told from the guy's POV - two of my not favourite things at the moment. my bad. for the most part, it was okay. i liked the romance, i liked the magical stuff. it was a bit too slowly paced for me though. it was sweet, i recommend it for a younger audience definitely. A beautifully written twist to a classic tale from the beast's point of view. More in-depth and descriptive, the author takes you through an a first heartbreaking then keenly satisfying tale that ends in a beautiful happily ever after. For fans of Beauty and the Beast, this is a MUST READ!